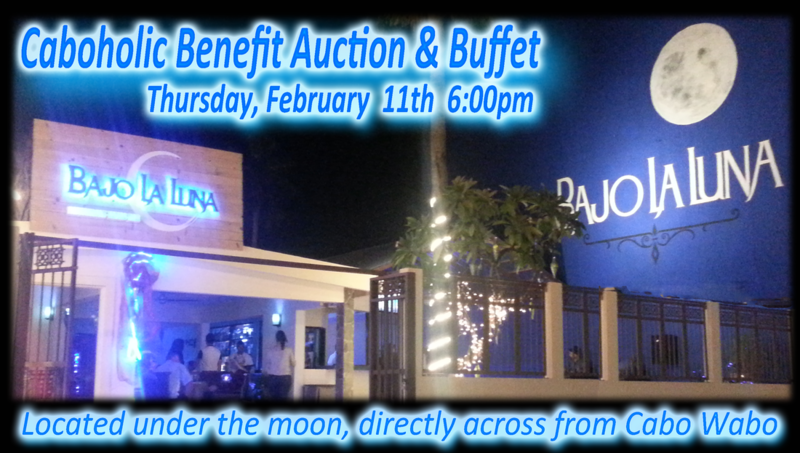 The Caboholic Auction Dinner is a non-profit event held annually to benefit a few charities in Los Cabos. All proceeds from the auction are donted to The Los Cabos Humane Society, El Ranchito Home for Dogs, and The Los Cabos Volunteer Fire Department. 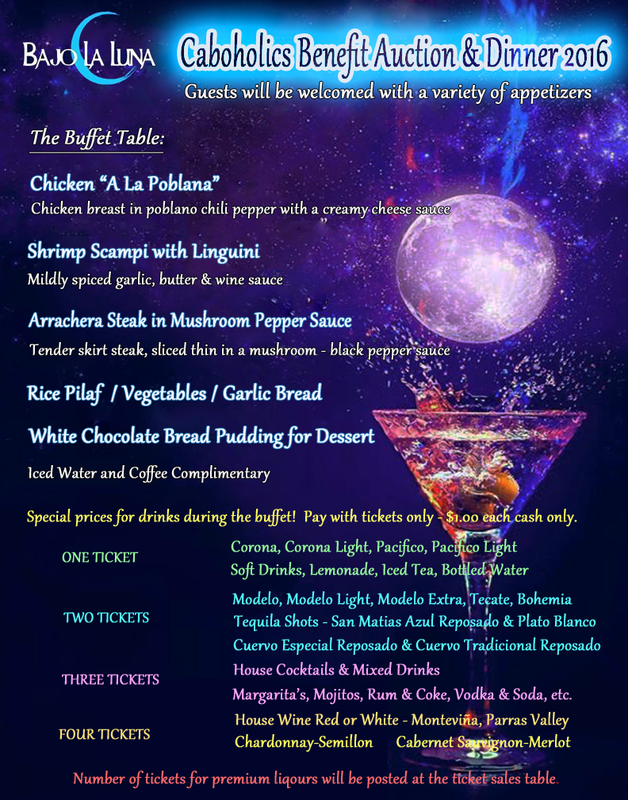 Our host this year is Bajo La Luna Restaurant . After accepting an invitation to visit this new restaurant, we found ourselves pleasantly surprised with the beautiful setting we encountered. The huge mural painting of the moon set against a baja night sky was simple, yet expressive. As we took a walking tour around restaurant, I couldn't help ​but believe that Bajo La Luna would be the perfect location for the auction dinner. You can find Bajo La Luna on FB. As I enjoyed a few gourmet appetizers and signature drinks, I pondered the possibility of such an opportunity. Could we have our auction dinner here? As most know the ticket price of $26.00 for our auction dinners is not all that much, especially when you consider the prepaid paypal fee and 16% for sales tax! That brings it down to about 20 bucks per person - I shuddered to even ask, expecting full well to be disappointed at a "no way" answer. A drink or two later, I was confident and fearless and threw the idea out there! As I discussed the whole idea with Sissy (one of the owners) I learned a little more about their integrity, as well as their genuine care and concern for their staff, and willingness to give back to the community. Sissy was also given a better understanding about Caboholics and what our convention week is all about. We agreed to discuss the details later, but it was a possibility! A few days later, I received details of what I'd say seemed more like a donation than a proposal! The menu was much more than I expected and the special pricing for drinks that evening was an added bonus for sure! They're even setting up several cash bars to ensure that there won't be a long wait at the main bar. They are going "all out" for us! I cannot express how happy I am to know that the 5th Annual Caboholic Auction Dinner will be taking place in such a beautiful setting. It's always amazed me how things just fall into place - it's just gotta be a bit of Caboholic Karma! ​as gratuity is not covered in with your dinner ticket price. Miguel Hill - The one and only "Cabo Cowboy"
I've seen Miguel and Luciano perform together on more than one occasion and it's an amazing treat to have them both playing at our Caboholic Auction Dinner! Here's a video of each one of them and also links to their FB pages at the bottom of this page. Please help me thank them by going to their pages, giving them a "Like" and leaving a comment thanking both these wonderful artists who are so willing to Give Back to the community! All auction items have been donated by local businesses, as well as individual members of the Caboholic Support Group. There will be both a live auction for a few items, as well as a silent auction for many items ranging from gift certificates to accommodations and everything in between. Items will be listed on line for review prior to the auction. There will be no on line bidding, but proxy bidders will be available to bid on your behalf. Silent Auction bids will be made by bidder number. Live bidding will be by hand raise. Winning bidders must pay cash or via pay-pal at close of auction and take the item with them. We clearly state although 100% of funds raised benefit the charities, we are not a registered charitable organization in the US, Canada, or Mexico and cannot issue a tax deductible receipt. Auction Items​.